Have I mentioned I’m still working on file sizes and photos? Because I am. 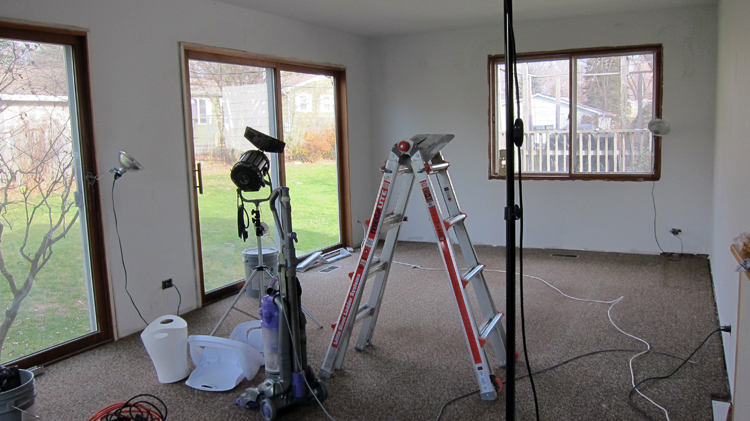 So this is what our family room looked like when we moved in! 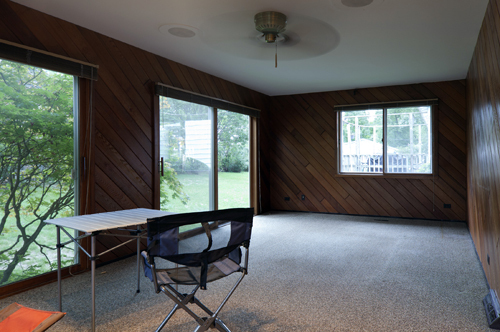 It’s a large, lovely space but with the dark cedar slats and old ceiling fan it looked dated and like an old man’s hunting lodge. Every great project starts with demolition! 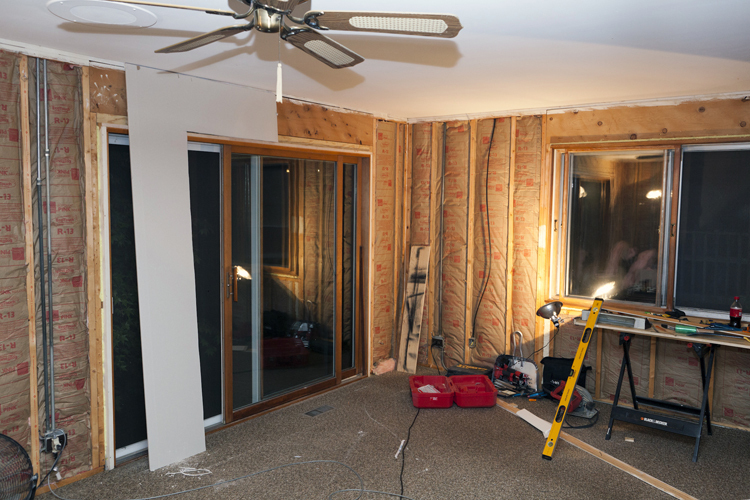 Dale pulled all the cedar slats down, put in new insulation and began rebuilding the room with fresh drywall. He also skimmed the ceiling. 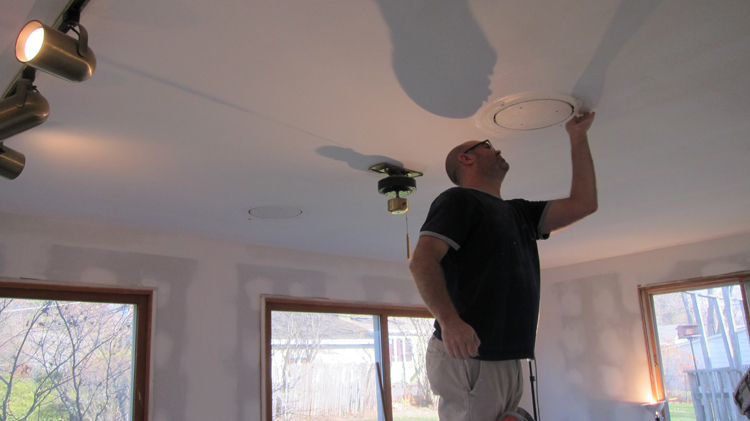 One of Dale’s favorite finishing touches was taking the old, defunct speakers out of the ceiling, patching the holes with small circles he cut out of drywall and then plastered over. There’s Dale putting in the final touches! 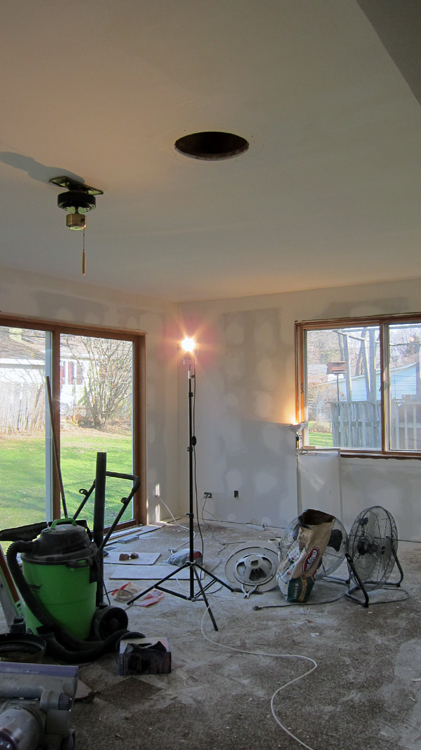 After the drywall was done, the room was primed with a base white. 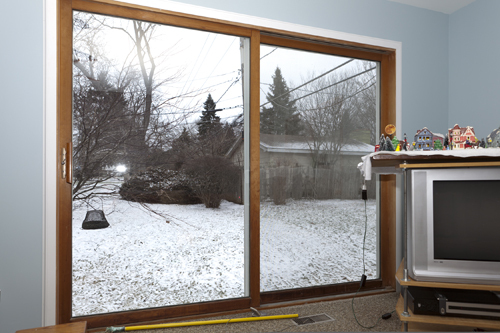 Monty, our cat, was just excited to be able to access the room and its many windows. Primed and ready from the original photo view! Next up, our friend Joe picked out the paints! 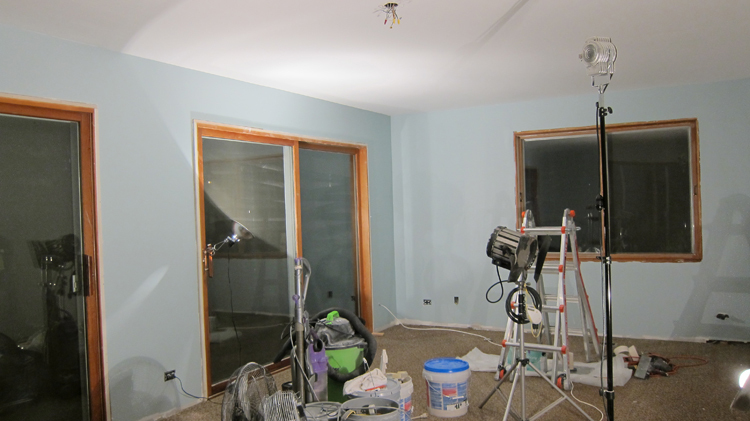 We were stuck and he got us to move forward with this lovely blue and a dark brown focal wall, a shout-out to the room’s original brown paneling. 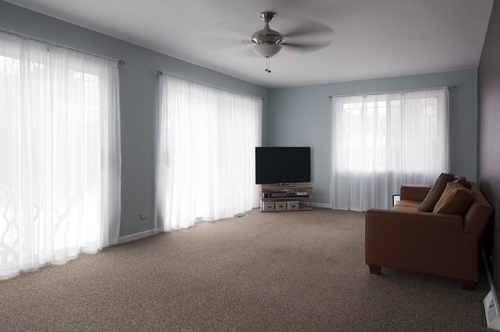 However, we don’t face the brown wall so the room is crazy bright and cheerful–even on dreary days it seems like we are surrounding by a bright blue border. Finally, we put up all new trim around the room. 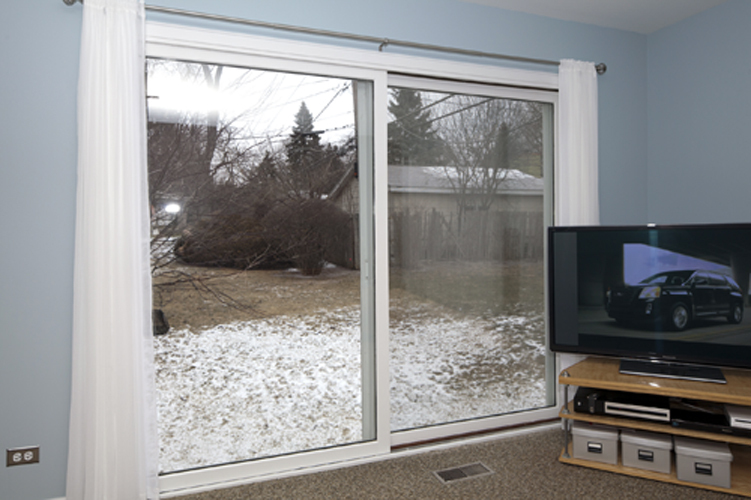 Dale had to cut custom framing for the over-sized sliding glass doors. All that was left was to paint the frames themselves. This was a real challenge! 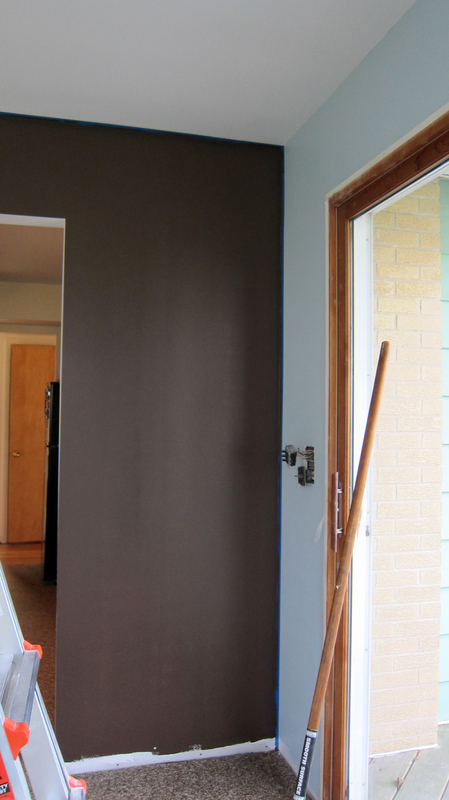 I had to paint the trim three times because the basic primer didn’t cover the wood. So this is the final product: pretty crisp white with blue paint. 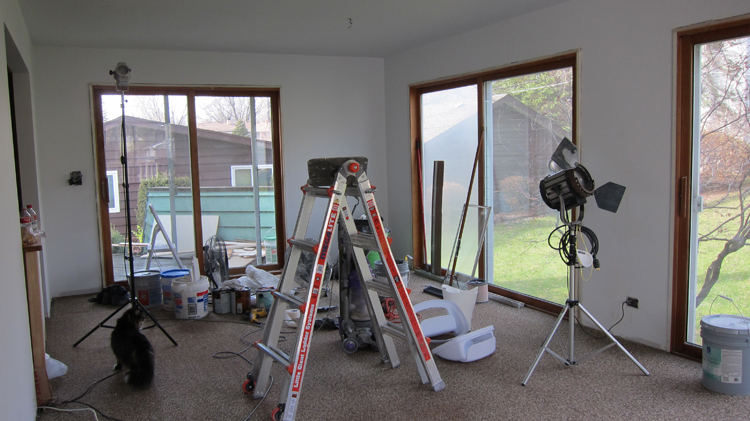 It has a long way to go to be finished but the new walls, paint, and trim, along with the simple white curtains, has brightened up the space considerably! 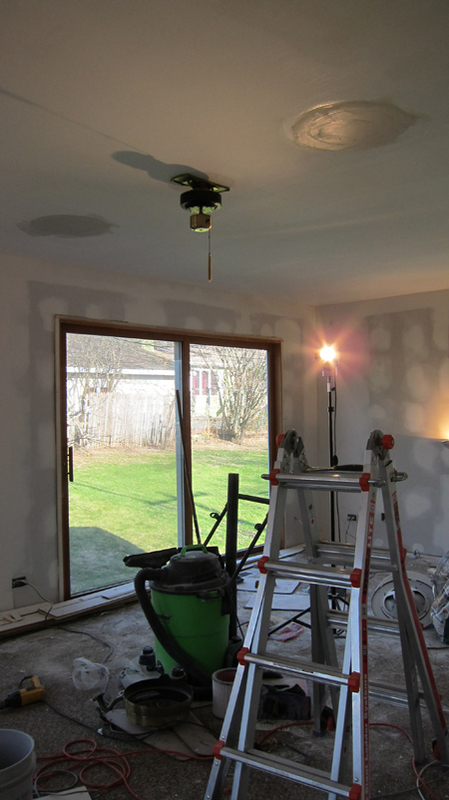 We also put up a new ceiling fan that is more our style–and has an actual light unlike the one that was there when we moved in. Wow! What a difference! Looks fantastic Rebecca and Dale; nice work!